But what isn’t typical or regular? The options are literally endless these days. Traditional yurts are portable, round type tents. They are covered with skins or felt and have been used for dwellings by nomads. Yurts can also be permanent structures. Historically, yurts have been popular and distinctive feature of Central Asia for at least 3000 years. These days, they are loved by many and some are very fancy. Tiny houses are awesome, just saying. You can fully customize them and make it the perfect house for you. Also, some companies are RVIA certified. This means that your tiny house “counts” and is considered an RV(if your tiny house is on wheels.) And why is that great? Because RVs have been around forever. They have places to be parked (RV parks,) plumbing that is ready to be hooked up, and more, making the transition that much easier. There are also “double wide” or village versions that are larger and stay in their location. Along with ones on wheels that literally allows you to go wherever you want. This is another new thing, and it’s awesome, too. Storage containers can be small tiny house type styles or huge. This is because you can put together as many as you want, therefore making it as big as you want. You can also use different sizes making it different shapes and more modern or more craftsman like, it’s all up to you! RVs have been around forever and are used all the time to this day. Also known as, motorhomes, campervans, caravans, travel trailers, camper trailers, fifth-wheel trailers, popup campers, and truck campers. These are great to live in because you can travel. Also, because they are so recognizable and have all the easiest ways to park, live, drive, and more, making it a great option. 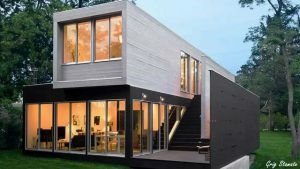 This is another new age option that falls along the same lines as tiny houses. Trucks, vans, and other larger vehicles can be converted into houses of sorts, I’ve even seen it done in buses. Just buy one of these vehicles, rip out the innards, and rebuild it. Easy, right? Not so much. It takes lots of work, lots of innovation, and lots of sweat (and tears,) to even plan out this project, much less execute it. But the results? They’re simply stunning. And again, when you start from scratch, (or take it apart so only the studs are left,) you can personalize it to your exact taste, likes, and needs.